Original Antique Maps and Prints. Rare Antique Print-ADAM AND EVE-PARADISE-FORBIDDEN FRUIT-Kallenberg-1539. Description: From: Giovanni Boccaccio’s: “Insigne opus de claris mulieribus”, published in Bern by Apiarius (also named Biener) 1539. This woodcut is dated 1537. Jakob Kallenberg’s initials appear on 9 of the 15 plates in this work. This work is one of the earliest printed books from Bern and is known for it’s elegant typograph, making it one of the most beautiful Swiss renaissance printings. Ref: Passarat IV 305, 1a; Nagler Monogr. Artists and Engravers: Made by’Jacob Kallenberg’ after own design. He is best known for his woodcuts in the Bannerbook:’Wapen, Des heiligen Romischen Reichs’ which was published in 1579. 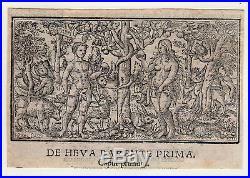 Subject: Antique print, titled:”De Heva Parente Prima, caput primum.’ – (The first parent Eve) Eve taking the forbidden fruit in earthly paradise, with Adam at her side. The image includes numerous animals, such as the snake, a monkey, a squirrel and several other forest animals. Condition: Very good, given age. Image trimmed from full book page. Please study scan carefully. Size (in cm): The overall size is ca. 14.5 x 9.8 cm. The image size is ca. 14.1 x 7.7 cm. Size (in inch): The overall size is ca. 5.7 x 3.9 inch. 5.6 x 3 inch. Medium: Woodcut on hand laid (verge) paper. ThePrintsCollector – Laurentius Old Master Prints Frans Laurentius, Peter Cornelissen Margo van Latum-van Dongen, Frank van Latum Located in Zeeland (Noord-Brabant) – The Netherlands. GO TO OUR STORE and explore our huge collection of fine antique maps and prints. Combined orders are possible! The item “Rare Antique Print-ADAM AND EVE-PARADISE-FORBIDDEN FRUIT-Kallenberg-1539″ is in sale since Monday, December 11, 2017. This item is in the category “Art\Art Prints”. The seller is “theprintscollector” and is located in Zeeland. This item can be shipped worldwide. Tags: antique, eve-paradise-forbidden, fruit-kallenberg-1539, print-adam, rare.